Youth Challenge brings together young people with physical disabilities and teen volunteers who inspire each other through adapted sports, recreation and social growth activities. Youth Challenge is the recognized leader in Northeast Ohio for enriching the lives of young people of all abilities, and supporting their growth and well-being. Participants: 225+ young people, ages 4-25, with physical disabilities, such as cerebral palsy, spina bifida and a variety of other disabilities. Volunteers: 450+ teens, ages 12-18, are trained seasonally by professionals and peers to work with children with physical disabilities. Programs: Over 400 activities are offered year-round with adaptive sports, arts and recreational equipment and adjustments to suit each child’s interests. All programs and transportation are offered free of charge. 95% of participants receive transportation from Youth Challenge’s fleet of accessible vans. 50% of all participants are between the ages of 8-13. 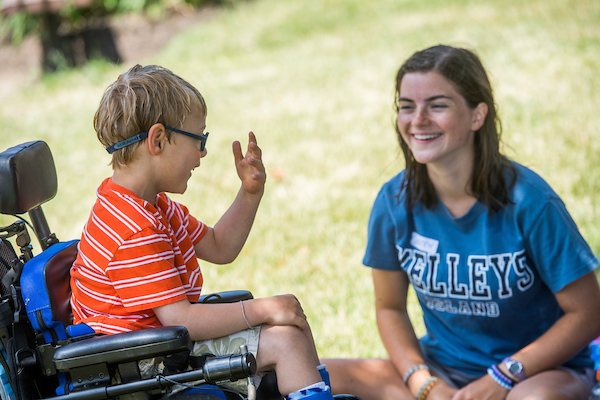 Founded in 1976 by Executive Director, Mary Sue (Anter) Tanis, as an alternative summer recreation program for children with physical disabilities. Hundreds of community volunteers and professionals assist with leadership, administrative and operational tasks. Copies of YC’s financial statement and IRS 501(c)(3) letter are available upon request.